If you are planning on undergoing a merger or acquisition, you need to be aware of any unclaimed property liabilities that you may be taking on. This is an often overlooked portion of a merger or acquisition, but unclaimed property non-compliance can cost your organization millions of dollars in fines and fees and expose you to costly audits. Mergers and acquisitions are temporary but resource-intensive events. There are many records and processes that must be accounted for to ensure a successful transition and minimize burdens to all stakeholders involved. One significant process for consideration is each company’s unclaimed property compliance; which is often an afterthought throughout the M&A process. Conducting a thorough examination and assessment of unclaimed property processes, liability and potential exposure of the company being acquired should be considered an integral step in the due diligence process of any potential merger or acquisition. Why Conduct a Pre-Merger Risk Assessment? When one entitiy acquires another, they also acquire any potential liabilities.  Unclaimed property liabilities are usually not reflected on on the books and records of the acquired entity. Organizations with recent M&A activity often find themselves at higher risk of an unclaimed property audit. By identifying and mitigating liabilities, you can avoid costly fines and penalties. State regulators levy an average fine of 12% per annum for past-due property. Our comprehensive pre-merger risk assessment provides the opportunity to dive into the accounting records of a potential acquisition target, identifying liabilities that may not have been brought to the surface during previous financial statement reviews. Our unclaimed property liability assessments stratify the levels of risk based on best case, worst case, and most likely scenarios. At the conclusion of our analysis, the liabilities may be so large that it delays or jeopardizes the deal. The identification of these liabilities can also provide valuable negotiation leverage – as one party’s liability may mean potential savings to the other. At the conclusion of our pre-merger risk assessment we also provide remediation and mitigation options such as proactive owner outreach. These measures are designed to clean up the records and minimize unclaimed property liability. By instituting these procedures and uncovering all potential risks and liabilities, your organization can ensure a solid foundation for ongoing compliance. For more information on conducting a pre-merger risk assessment for unclaimed property liability, please contact a member of Keane’s National Consulting & Advisory Services Team.